It’s that time again. A new year is here. That means millions of Americans are making resolutions to lose weight, quit smoking, pursue a new hobby, or change their life in some other meaningful way. And some people are even looking for ways to improve their machine shop productivity. Make 2017 your best year yet! In fact, 45 percent of Americans make resolutions every year. Guess how many stick to their resolutions? If you guessed not many, you’re correct. Only 8 percent of people actually achieve their goals for the new year. However, if you have discipline and focus, it’s possible to make a positive, impactful change that will have benefit for years to come. This year, why not try to make a lasting change in your machine shop productivity? There are probably a number of issues, processes, and improvements that you’ve wanted to address for some time. The beginning of the year is the perfect time to drill down on those items and develop an action plan. 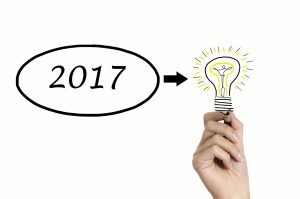 Below are a few steps you could take to improve your shop’s performance and make 2017 your best year yet. By implementing even one of these ideas, you’ll likely see an improvement in your bottom line. If you can tackle two or three of them, you might revolutionize your shop. How many jobs does your shop complete every month that cost you money? If you’re like many shops, it’s probably a higher number than you think. There are lots of reasons why shops perform losing jobs. They may think they need to take on a job to keep a customer happy, even though the job is well outside the shop’s comfort zone. Or they may bid too low to win the business, wrongly assuming they can keep costs under control. Most of the time, though, shops don’t even realize the jobs are costing them money. They think they’re profitable because they didn’t account for overhead, overruns, delays, and other costs in their estimate. Or they may not even truly understand their labor and material costs. This all negatively impacts machine shop productivity. This year, make a commitment to clearly understand your costs. That way you can quickly identify whether a job is profitable or not. If it’s not, you can either reevaluate your inputs, charge a higher price, or pass on the job altogether. In theory, you have a defined schedule and process. In reality, the schedule rarely works out as planned. Jobs take longer than expected. You don’t have an accurate view into materials and inventory, so you don’t realize that you’re missing an important part. A customer orders a rush job that throws the entire system out of whack. These things happen. And they impact your machine shop productivity. The problem, though, is that when customers don’t trust your ability to deliver on time, they begin to doubt the relationship. That may drive them to look elsewhere. More importantly, though, schedule delays cost you money. The more jobs you can turn, the more revenue comes in the door. Make this the year you turn your hypothetical scheduling process into a reality. Ditch the post-it notes and spreadsheets and invest in shop software. You can use software to get complete transparency into your schedule and resources, make last-minute changes, and view potential bottlenecks before they happen. Every business would love to have more customers. Often, though, it’s easier to drive additional revenue from existing customers than to attract a new one. After all, your current customers already trust you. You just have to give them a reason to give you more money. If you can achieve the previous two points, you could use those as leverage to drive more revenue. For example, if you can offer an ultra-quick turnaround on certain jobs, you might be able to charge a higher rate. With a better handle on your time, costs, and resources, you might be able to take on additional work. You also may be able to drive new business by simply communicating more frequently. Offer regular check-in calls to keep them up-to-date. You could use shop software to give them real-time updates on job status and shipment tracking. With more outreach and better service, you may be able to approach them for new work. Every shop experiences it at some point. A valuable team member leaves unexpectedly to take a job elsewhere. One of your most experienced and skilled worker decides to retire without a suitable replacement available to fill the void. Or you hire someone to fill a key role, only to find out quickly that they’re not right for the job. Even the most efficiently-run shops can be damaged by labor issues. It takes time and money to find, hire, and train a new employee, and that’s assuming that you can even find someone who meets your standards. While you’re trying to find someone, you may be dealing with shortages on the shop floor and delayed production schedules. Make 2017 the year that you finally build a deep farm system of talent. Create pool of skilled workers you can draw from when an opening exists. Partner with a local vocational school and create internship opportunities. Meet with local skilled workers so you can develop a relationship and gauge their interest if and when an opening becomes available. Consider hiring veterans or career-changers and helping them train in your field. Most of all, evaluate your current benefits, compensation, and culture. Sometimes the best way to avoid labor issues is to retain the employees you already have. Ask for input from your team and then make changes that will make your shop a better place to work. There’s one item on this list that can make it easier for you to accomplish every other goal. Manufacturing software impacts every corner of your shop’s operations, from estimating to scheduling to materials management and more. With job shop or machine shop software in place, you can control your schedule, understand your costs, attract more business from your customers, and even make your business a more enjoyable place to work. With Shoptech Software’s E2 Shop System, you get instant transparency into your operations and processes, along with the tools you need to take quick action. These are definitely ways to improve your machine shop productivity. Ready to make 2017 your best year yet? Let’s talk about your goals and how you can achieve them. Our E2 consultants welcome the opportunity to speak with you. Contact us today to learn more about how E2 manufacturing software can help your shop reach new levels of success in 2017. Want a closer look at the E2 Shop System? Register for a FREE overview today!